I was given a copy of this book by the author when I was three as she is a friend of my mums. I didn't manage to read and understand it until quite a bit later though! When I did, as a seven year old I was convinced the character of Jenny was named after me - looking back on it I'm fairly sure that was a coincidence, and she was actually named after the much more famous Guinevere (Jennifer in Welsh) but never mind eh? Anyway, bias aside, this is a fantastic children's book, and I wish it was better known and that more people could share the magic it creates. The protagonist, Art, is a young boy who is wheelchair-bound, who finds writing his main outlet of energy and creativity. His imagination leads him to believe that he is the Pendragon, King Arthur resurrected, and that several of his friends and acquaintances are all part of the legend. 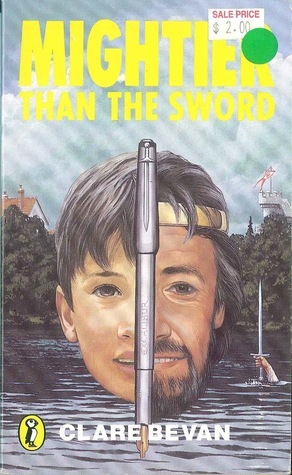 He is given a fountain pen which he calls Excalibur after Arthur's famous sword in the stone, and begins a game that ends up very real. Maybe he really is the great man himself??? Touching, comic and exciting, it's also a lovely way to get children interested in writing, as well as reading - the pen is mightier than the sword. I urge you to read it.